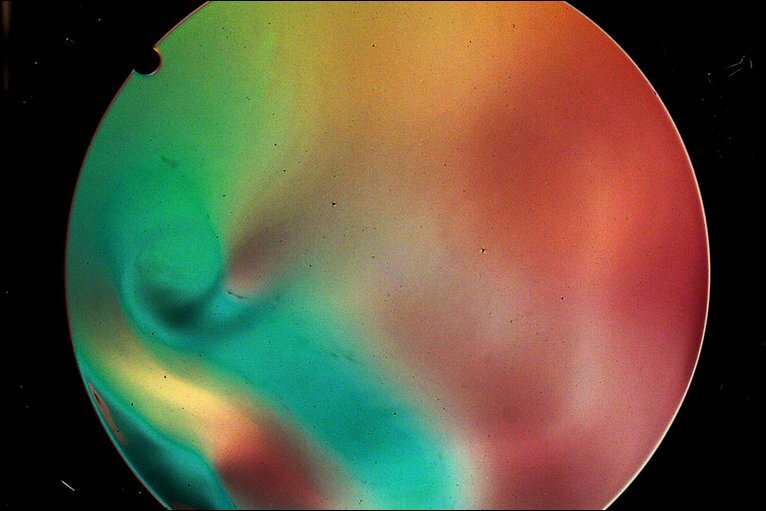 How do you recreate the dynamics of the Earth’s oceans in a laboratory? 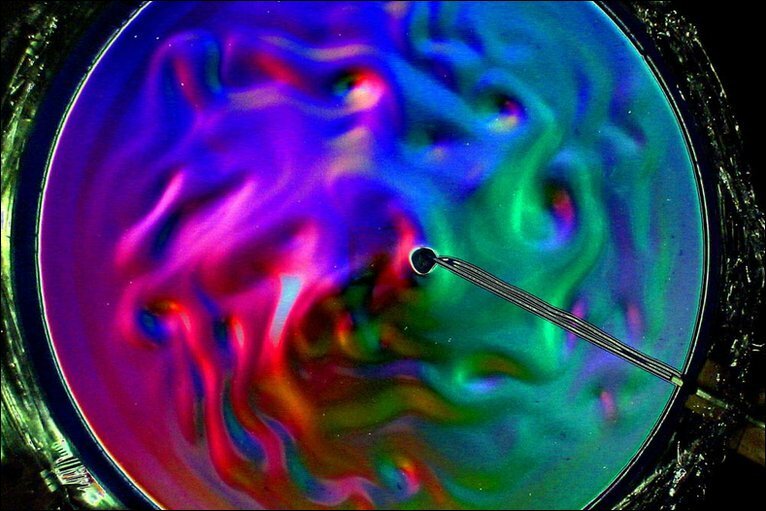 This is exactly what Iakov Afanassiev from Memorial University of Newfoundland, Canada, has done with an experiment using a rotating platform of fluid. The shape and rotation of the Earth are crucial in ocean dynamics, and the platform mimics both of these. The centre can be thought of as the North Pole. 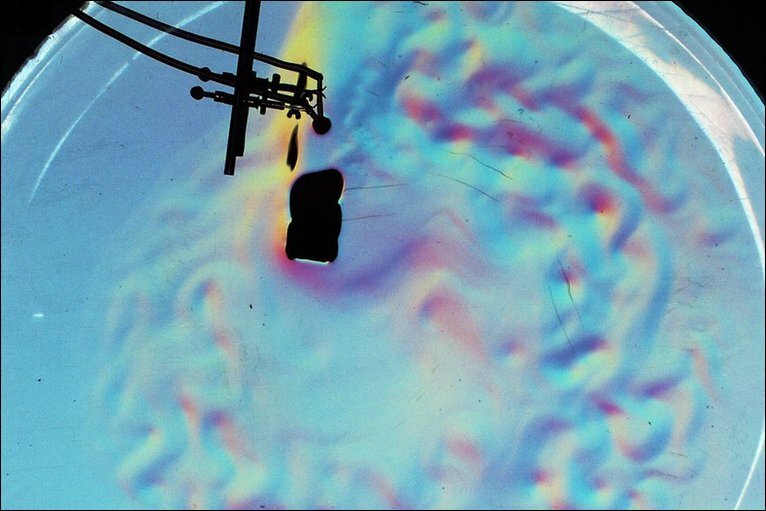 This fluorescent "ocean" of fluid is observed by cameras from above. 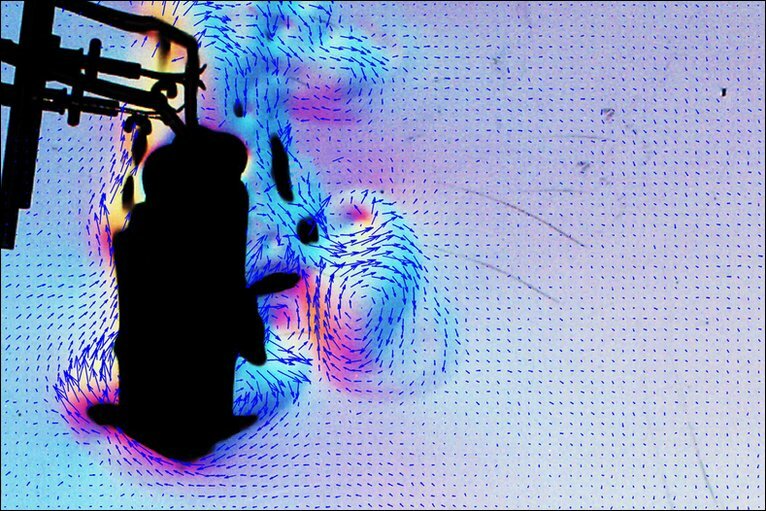 A coloured filter above the platform enables the team to "code" the topography of the fluid's surface - the tiniest of perturbations appear as different colours. Here, a wave occurs downstream of a model underwater mountain on the floor of the tank. 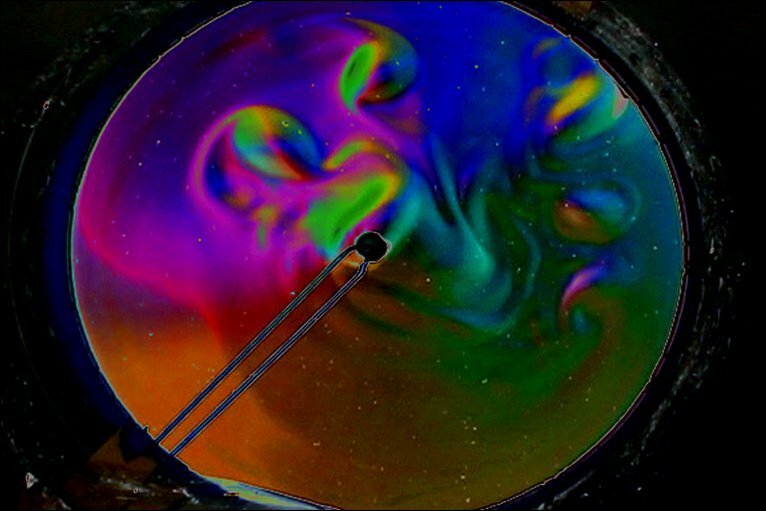 Researchers have used the experiment to recreate a planetary scale wave known as a Rossby wave, which travels from the eastern to the western boundary of the ocean. Here the wave, which is blue and green, forms to the west of the model mountain. 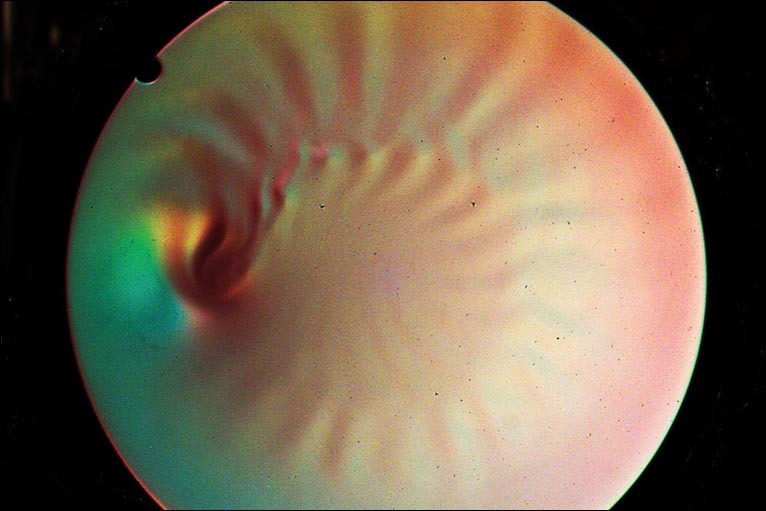 “Vortices [or spinning motions of fluid] are abundant in the ocean and are often observed on satellite images,” explains Professor Afanassiev. With this experiment, they can be reproduced and studied in detail. The ocean plays a major role in our climate. 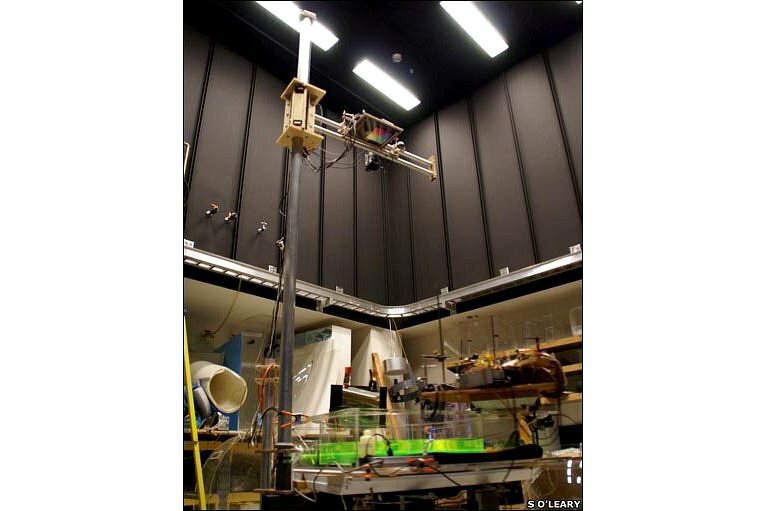 This experiment allows scientists to observe its dynamics and to take detailed measurements of their speed and direction. The results can be used to improve mathematical models of climatic processes. 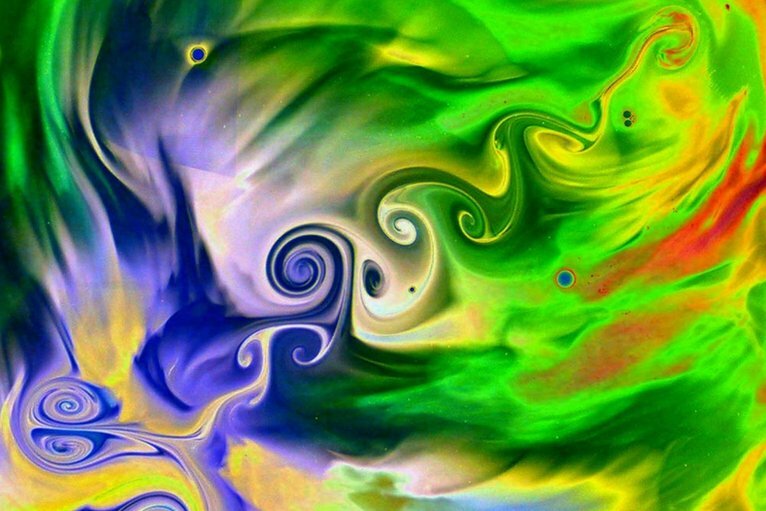 Planetary scale waves also contribute to the formation of narrow jets – just like jet streams in the atmosphere. These are more subtle than atmospheric jets, but are likely to play an important role in climate.